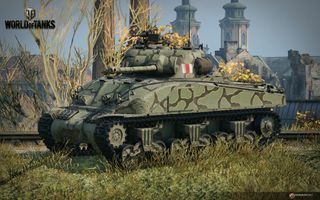 Der Sherman Firefly ist ein britischer mittlerer Panzer der Stufe 6. Diese britische Version des amerikanischen M4 Sherman wurde Anfang 1944 entwickelt. Sie unterschied sich von der US-Ausführung durch den stärkeren 17-Pfünder, andere Platzierung von Funkgerät und Munition, Wegfall des Buggeschützes und der Helferposition des Fahrers. Es wurden zwischen 2100 und 2300 Fahrzeuge aller Ausführungen von 1944 bis 1945 gebaut. 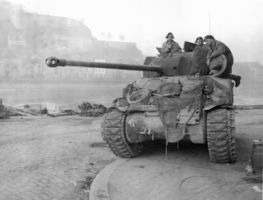 Der Sherman Firefly führt zum Challenger. Abysmal gun depression and dispersion bloom while on move or during turret rotation. Tall target with weak armor and fragile modules, especially the engine. Very vulnerable to SPGs. Inferior to most tier 6 mediums in every aspects except the gun performance. 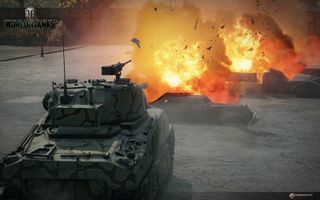 While the hit point pool, turret and hull traverse and armor are comparable to flankers such as the M4A3E8 Sherman, the Cromwell and the T-34-85, it is significantly slower, slightly faster than a M4A3E2 Sherman Jumbo, but lacking the Jumbo's armor. It also lacks their higher-powered engines. Therefore, it should be treated as a secondline support tank, sniping behind concealment, teammates and if possible, terrain features or wrecked vehicles. Best practice is to stay behind the front picking up targets of opportunity, softening up the enemy allowing your brawlers to create breaks in the enemy lines and using your functional mobility to maintain covering positions and taking cover when engaged by heavy hitting opponents. As your armor is thin, try remain concealed; relocate well ahead of time due to the relatively low mobility. Hull-down positions are practical, but significantly harder compared to other variants of the Sherman due to uncharacteristically poor gun depression. The OQF 17-pdr Gun Mk. 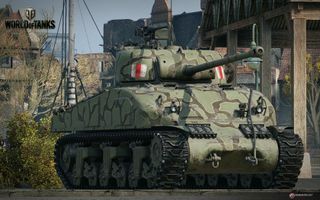 VII and your excellent turret and hull traverse, comparable to the M4A3E8 Sherman, does give sufficient performance for brawling when the need arises. While this tactic may work against isolated heavy tanks in a fashion similar to more dedicated flankers, it will be easily dispatched by more dedicated flankers in this role, as its sole advantage, armor penetration, is irrelevant against tanks with negligible protection, and its slow top speed and modest engine will work against you. 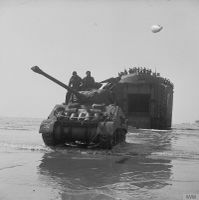 As Britain struggled to develop tanks capable of equaling the superior German panzers, the decision was made to convert existing stocks of M4 Sherman tanks into a more powerful variant. In late August 1943, the British began developing a variant of the Sherman mounting the 17 pounder anti-tank gun. The so-called Sherman Firefly featured a long-barreled 17-pdr gun that was much more effective than the original 75 mm gun, capable of penetrating a Tiger I's frontal armour at a distance of 1,000 metres using regular ammunition. In order to successfully mount the 17-pdr gun into the turret, various modifications had to be made, such as replacing gun mantlet, moving wireless set to armoured box at rear of turret, installing loaders hatch on turret roof and welding left side pistol port shut. 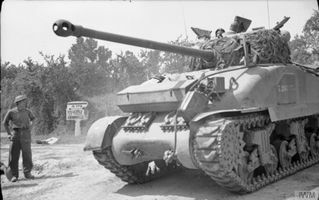 The first several months worth of Fireflies were adapted from M4A4 tanks, designated Sherman V by the British, but soon the viability of other models was explored. 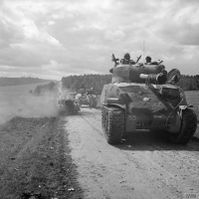 By May 1944, the M4 variant, or Sherman I, was being converted in modest numbers. The Sherman VC and IC variants were easily distinguished by their lower hulls; the VC having a riveted lower glacis with a curved shape while the IC has a welded and angled lower glacis. The IC Hybrid can be distinguished by its upper cast hull, giving it a distinctive curved look. 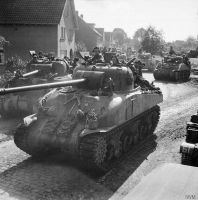 Tanks rearmed with the 17-pdr gun were given the suffix C, with the resulting units being designated Sherman VC, IC and IC Hybrid. Of the 600 Fireflies in service by D-Day, the vast majority were VCs, but they were eventually outnumbered two-to-one by Sherman ICs. A total of 2,139 Firefly tanks were built by February 1945. Three different Sherman models were converted to Fireflies: the M4, M4 Composite and M4A4. 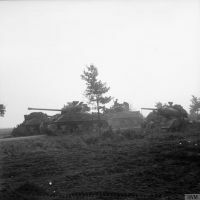 The British designated them as Sherman I, Sherman I Hybrid and Sherman V respectively. The Firefly depicted is a converted M4 Composite/Sherman I Hybrid, or Sherman IC Hybrid, judging by its rounded cast front welded to the hull. 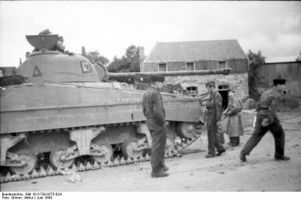 The most commonly converted tank was the M4A4/Sherman V, which had a Chrysler A57 Multibank engine and a different welded and lengthened hull with sharp edges. Sherman Fireflies normally did not mount the M2 Browning machine gun on the turret. Diese Seite wurde zuletzt am 27. März 2017 um 11:00 Uhr geändert.